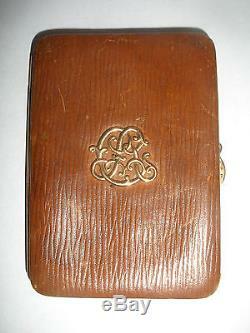 Rare Antique French GUSTAVE KELLER Paris leather and 18k gold card case. Keller 22 rue Joubert Paris. Measures approximate 3 1/2" x 2 3/4". Founded by Gustave Keller in 1856, the firm made elegant accessories and sets which were immediately appreciated for their fine quality. At the Paris World Exhibitions of 1867 and 1878, Keller was presented with silver and gold medals. After 1878, the Keller brothers succeeded him. The firm was later known as "Keller fils et gendre successeurs". First established in Paris at 65, Rue de Turbigo, Keller moved the shop and workshop to 22 rue Joubert in 1891. In 1929, the shop was mentioned as trading from 18 Avenue Matignon and was still known to be active in the 1920s and possibly as late as 1947. In 1889, Lucien Falize wrote that everything stamped Keller is good and the firm was rewarded at the 1889 and 1900 Paris World Fairs by a gold medal and a Grand prix respectively. At the Paris Exposition Universelle de 1900, gold and silversmiths competed in interpreting the allegorical and naturalistic ornamentation of the Art Nouveau by zealously demonstrating their skills in chased, cast and embossed silverwork. In marked contrast and absolutely exceptional in contemporary Parisian silverwork of this period, several works by Keller Frères were astonishing in their simplicity. They produced a small series of wine and water pitchers for the exhibition, which surprised all by their bold shapes and utter sobriety, including examples in hammered silver and gold-plated silver. Some had robust, angular shapes, whilst others were, like this jug, notable for the unusual fluidity of their design. These hand wrought objects, the forerunners of modernism and later mass produced industrial design, aroused the enthusiasm of Roger Marx who applauded their efforts "of introducing gold and silverwork without relief, without chasing, a unified style of silverwork where only the quality of the lines, the curves and the shapes are important". Keller was appointed official supplier to several European courts including those of Spain, Russia, Greece and Romania and from the 1900s they were commissioned to produce several important cups and trophies for the Principality of Monaco. The firm attracted many brilliant and international clients with members of the Russian Court being probably the most important. Examples of the firms work can be found in notable collections including those of the Musée des Arts Décoratifs, and the Musée d'Orsay, France and the Imperial State Hermitage in St Petersburg. PLEASE SEE THE PICTURES FOR CONDITION AND JUDGE FOR YOURSELF. ITEMS I SELL ARE NOT BRAND NEW AND DO HAVE WEAR EXPECTED WITH THEIR AGE... The item "Antique Victorian French GUSTAVE KELLER Paris leather 18k gold luxury card case" is in sale since Saturday, July 12, 2014. This item is in the category "Antiques\Periods & Styles\Victorian". The seller is "mdeur29" and is located in Scotch Plains, New Jersey. This item can be shipped worldwide.